When Edison was working on the electric light he was concerned about the total light output and comparing that to a kerosene lantern or some other light then in use. To do this he used an integrating sphere (Wiki). The idea is that light will bounce around inside the sphere (painted a very reflective white on the inside) and in the process integrate all the light. A sensor is also in the sphere, but there is no direct path from the light source to the sensor. Lumens (Wiki) is the common measure for light. The light actually falling on a subject is measured in Lux (Wiki) where a Lux is 1 Lumen per square meter. Lux varies from 0.0001 (overcast night sky) to 100,000 Direct Sunlight. Also see Star Magnitude. A prior unit for measuring the light falling on a surface was the Candlepower (Wiki). Flashlights are commonly rated based on their total Lumen output. But that does not tell you much since that light may be spread over a hemisphere like from a camping lantern or focused into a sharp beam. I started this web page because I want to measure the light output from a bunch of flashlights that all use a AA battery, so hopefully this 4" sphere will work. A sphere may be made in two parts that are bolted together using a flange. That allows coating the inside surface with something very white. 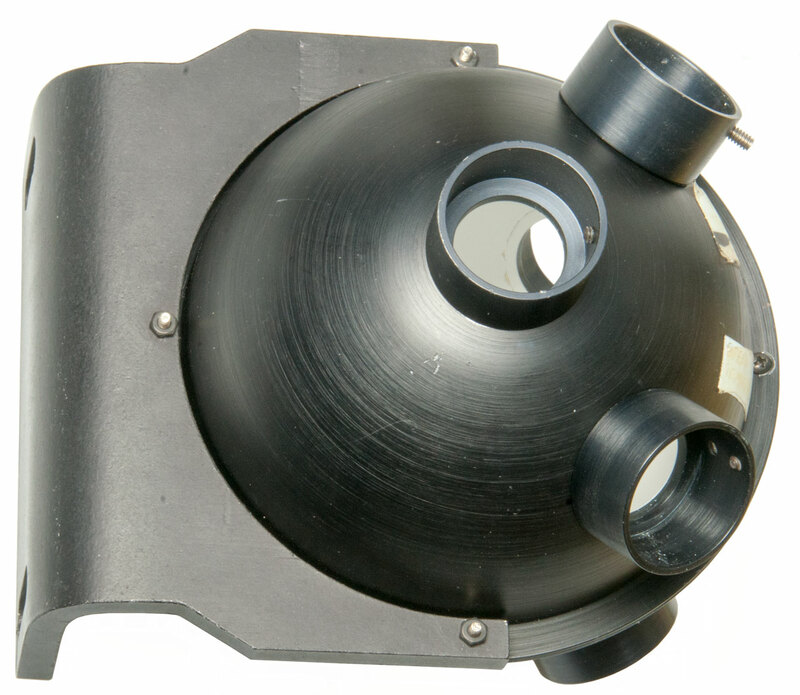 They also have a number of "ports" so that light can enter the sphere, for various types of photo sensors and maybe one or more standard light sources for calibration. Each hemisphere has 3 ports. One at the top center and two additional ports down 45 degrees and these are seperated by 90 degrees. One of the top ports is empty (input?) the opposite top port is plugged. 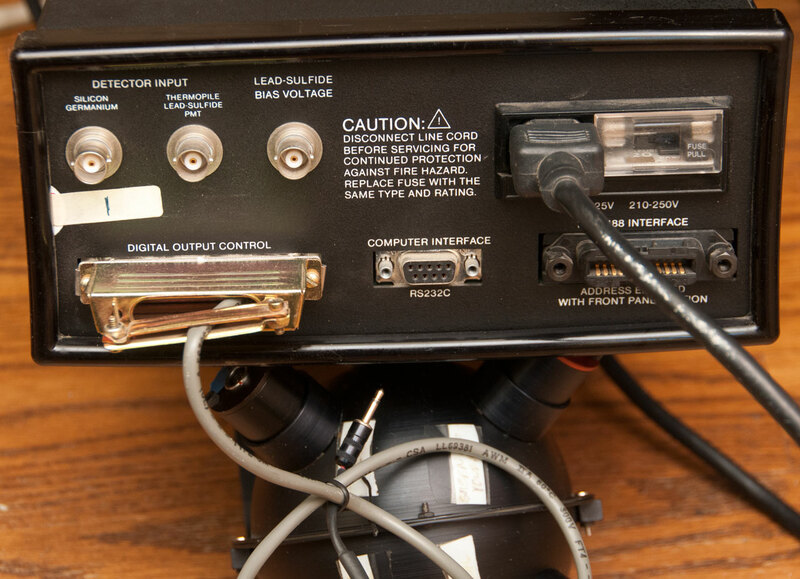 The other 4 ports have some type of electro optical gadget installed with a 4 socket connector. Port pinch hex set screws are 4-40 thread and 0.050" hex wrench. 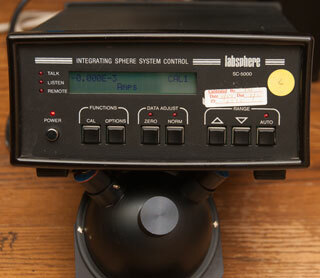 Detectors web page - Datasheet - mentions 1.2" standard port, so newer than this integrating sphere. 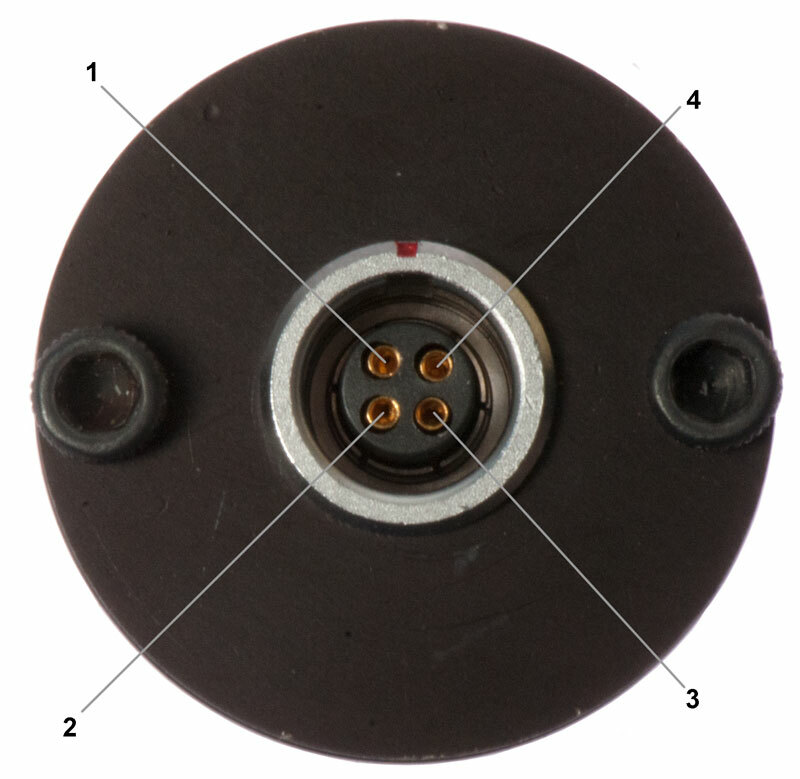 Allen screws on connector plate: 3/32"
The ports on the integrating sphere have a lip to prevent the sensor from falling inside (see Fig 1 and Fig 2) where the hole in the lip is 0.750" dia. Lemo connector. mating shell may be FGG.0B.304.CLAD52. the sensor PCB is p/n 87-1062-14 Rev A.
Thor Labs photodiode overview (but not the FND-100). The TO-5 package (Wiki) body 5/16" dia (the flange has been ground down eliminating the tab. This package supports between 2 and 10 leads. The TO-5 to 3/4" gap filler part is black metal. 3 leads: Anode, Cathode & Case. 100 V reverse bias typical. 400 to 1150 nm spectral response, peaks around 900 nm. The voltage output on pins 1 and 4 is near zero when it's dark and goes up to hundreds of mV with bright light (EA4 Flashlight 860 Lumens). The BNC and MS connectors seem to have the same signal, so maybe for different photometer models? 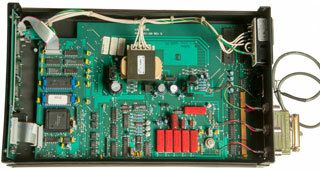 The SC-5000 has BNC inputs. 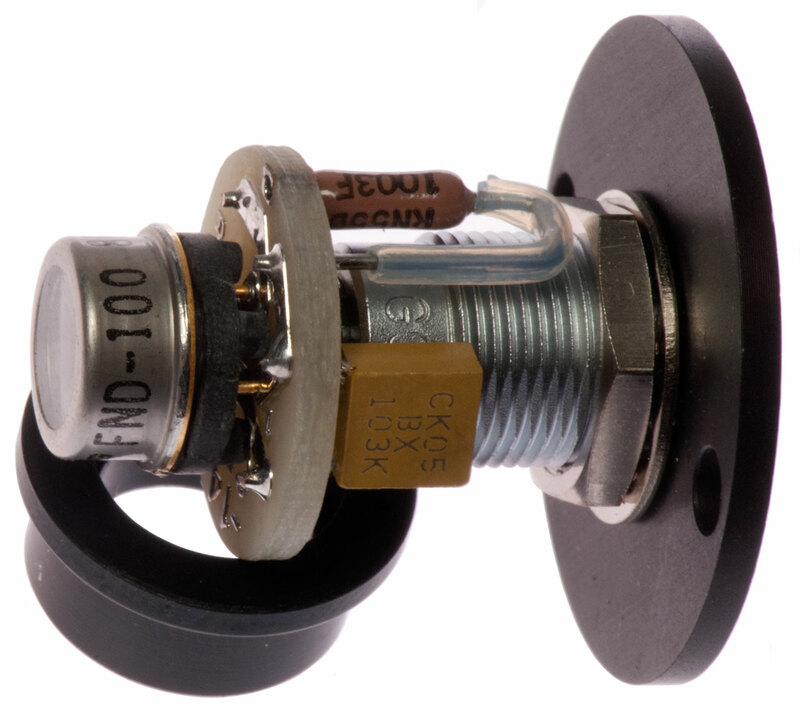 Has 1003F with CK05BX 103K CAP AND 511K resistor with CK05BX 223K capacitor. 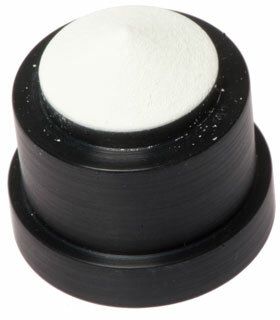 The TO-5 to 3/4" gap filler part is white plastic. This sensor has a very dense neutral density filter fitted that does not want to come off. 2 resistors & 2 caps - maybe different wiring? 4 pF (100V) compared to 8.5 pF (90V) for the FND-100 so faster. Sensor numbering as shown in Fig 11 below. Measured with FLuke 87 V DMM on mVDC range. No. 4 seems to be dead. That may account for thinking there was a cable problem. No. 1 has a dense filter installed hence the lower readings for room and bright light. 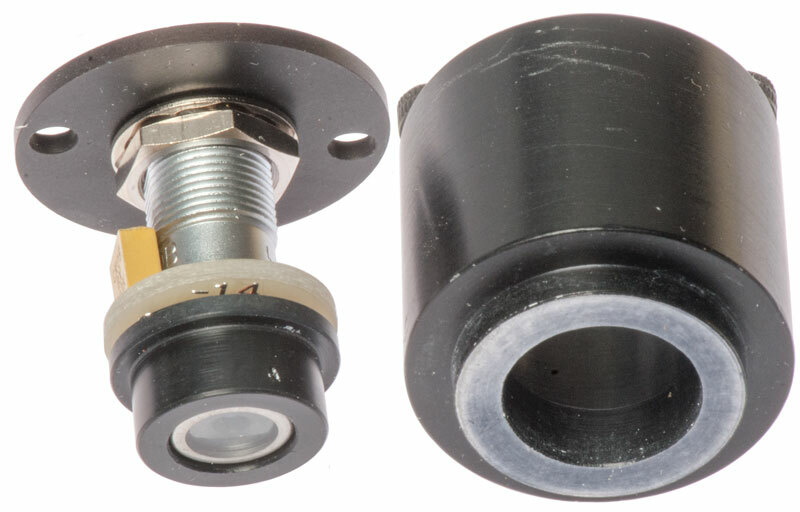 These fit between the sensor and the 3/4" hole at the bottom of the port. They have a 3/4" male nose and a 3/4" female tail that accepts the nose of the sensor. That means you can stack them. The tip of the nose is white. 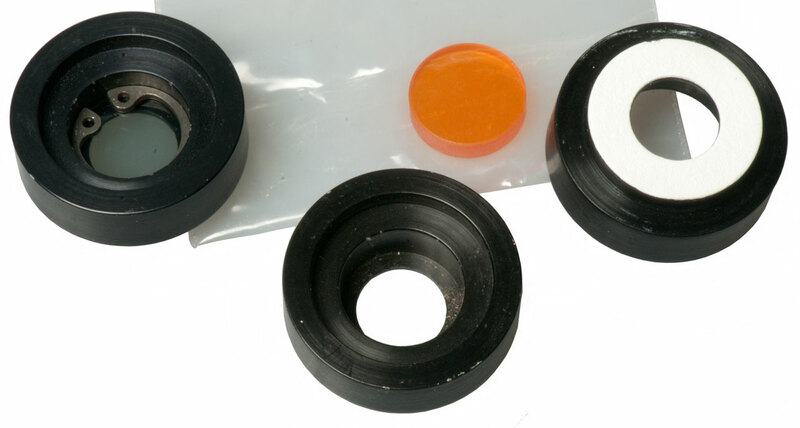 There is no groove for a snap ring. The snap ring is a friction fit inside the 1/2" filter cavity. Both cables have electrical problems. Sensor 4-pin connector marked: LEMO FHG 0B. See Fig 10. 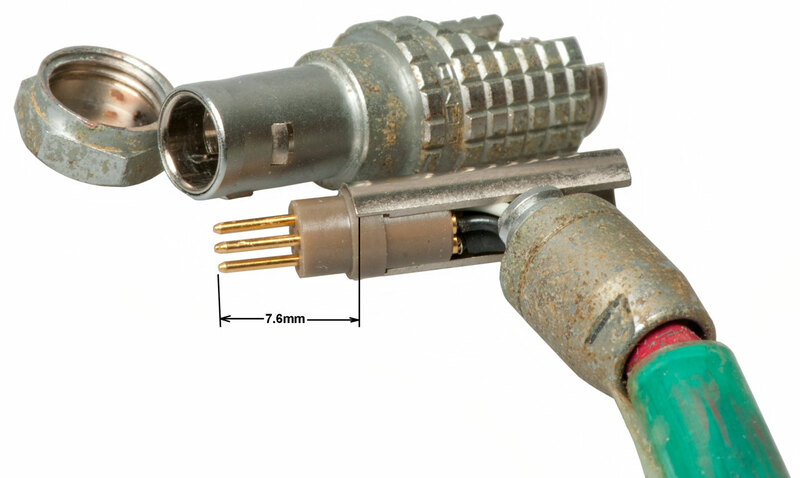 The cable with wire ends has the male pins inside the LEMO connector set way too far back, i.e. they are not plugging into the sensor. Not the case, just different male pin lengths. 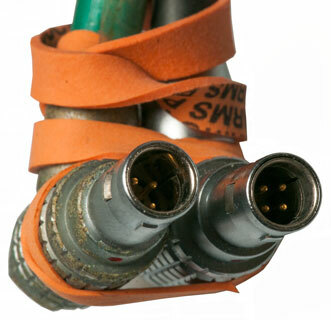 The cable with BNC and MS connectors has opens or shorts. Need to test . . . The bare wire end cable works fine. More LEMO connectors on order (FGG 0B). Fig 2 The 4-40 set screws take a 0.050" hex wrench. Fig 3 Sensor + 2 cables. Other cable only has 4-pin Lemo and wire ends. Black & White wires & Coax shield + Center conductor. Fig 5 Plug has cone shaped white end. The pin insert shown protrudes 7.6mm. The protrusion on the other cable is 9.6mm, i.e. longer pins. 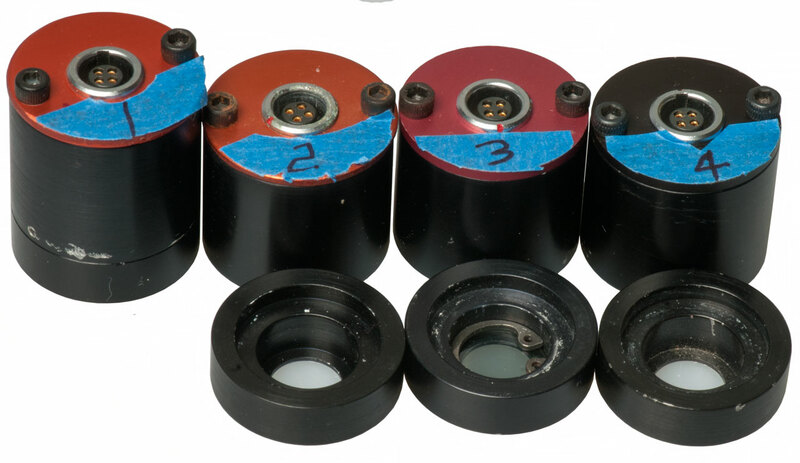 Fig 11 4 Sensors & Filter Housings w/sensors numbered. I'm guessing this was made to work with 1" ports since the sensor is 1" in diameter. I expect the nose to be 3/4", waiting for it to get here. Has three BNC jacks. They have floating shields. i.e. each shield is independent of the other shields and chassis ground. Silicon or Germanium diodes operated in photovoltaic mode (i.e. diode generates voltage/current) best measured as current into a virtual short. Diode- to center pin. 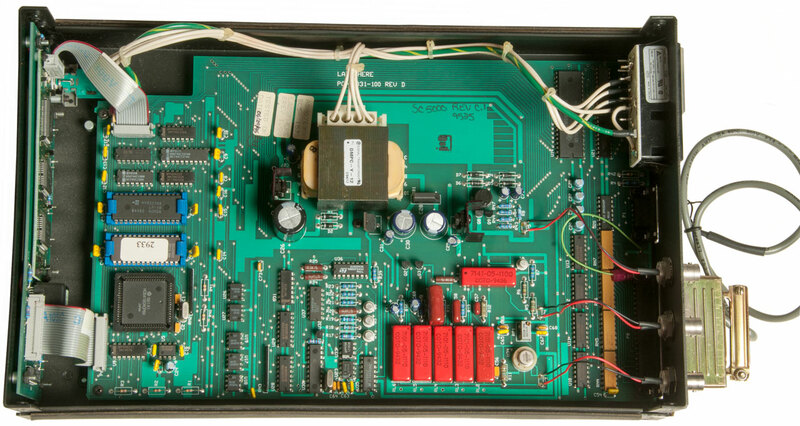 There are 3 BNC-f inputs on the back panel but there does not seem to be any way to select which is used on the front panel. Guessing that only one of the three can be used at any one time so no need to select. 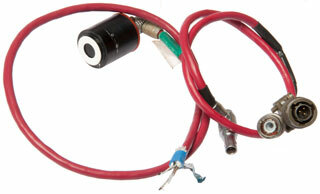 It is not clear what types of sensor and how it is wired to the SC-5000. Also what bias mode is used for the Silicon diode. If you know about operation or have a manual please let me know. display shows current that varies with input (Cal1: Amps mode). 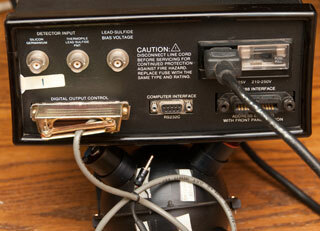 Note three different channels of input. Digital & front panel on left. Did not find any patents for the integrating sphere itself, only patents that use one to accomplish some task. LabSphere - Integrating Sphere Theory & Design.pdf - Integrating Spheres - The Light Measuring spheres range for 1.4 to 2 meters ID. 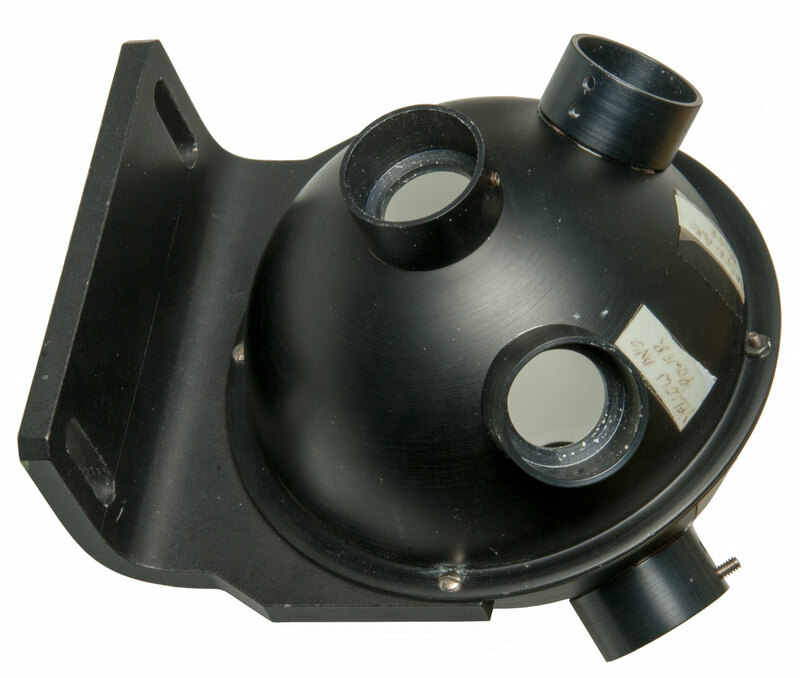 The Reflectance/Transmittance spheres are all 6" ID with a larger than normal port for the sample. General Purpose includes a number of 4" ID spheres. These come with either 3 or 4 ports located in different places. Newport - Integrating Sphere Fundamentals and Applications - Port plugs come in sizes: 1/2", 1", 1-1/2", 2,5"